BuildMadison took place on Sept. 24-25, and WYZGYZ was there. The event is a 24 hour code-a-thon where people present ideas, then everybody forms groups, then they spend the next 24 hours building their idea, and at the end people present their project for prizes. Our team took second place and won a year of virtual server hosting from Supranet. More details about the event can be found at the Build Madison Recap. Our project was something called Goalkeeper. The person with the idea, Deb Gurke, works with the Wisconsin Association of School Boards, and her problem centered around evaluating teachers. Federal requirements state that teachers should be evaluated in part based on their students progress towards specific standards. 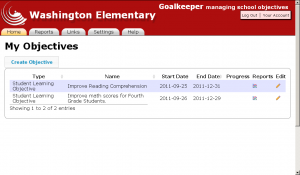 What she wanted was an application that would help principals and teachers create student learning objectives (goals), that aligned with those standards at a federal, state, district, and school level. 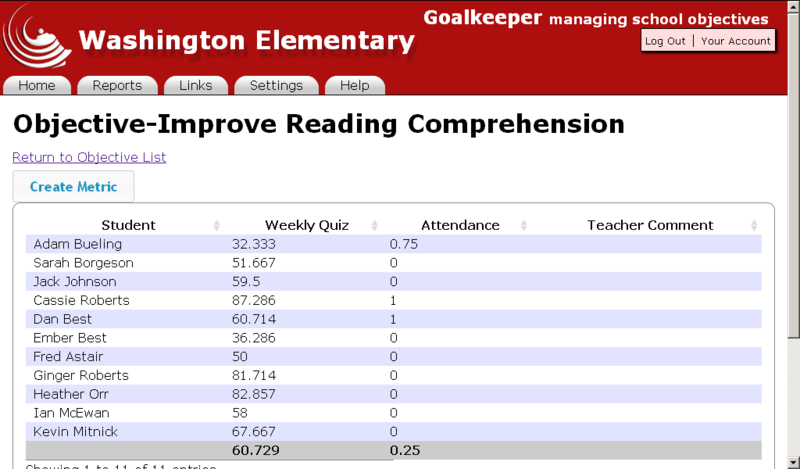 Teachers evaluate students, principals evaluate teachers, districts evaluate schools, and the state evaluates students. For every goal, there need to be metrics, and for every metric there need to be evaluations. In less than 24 hours I built a role-based system that allowed teachers to create student learning objectives, create metrics associated with those objectives, and grade students against those metrics on a variety of scales. 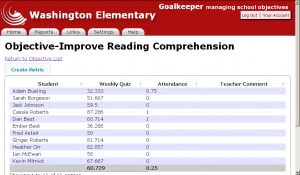 As an example, an objective might be to improve class attendance, and a metric could be whether they were there each day, and the measurements would be checkboxes for each day. 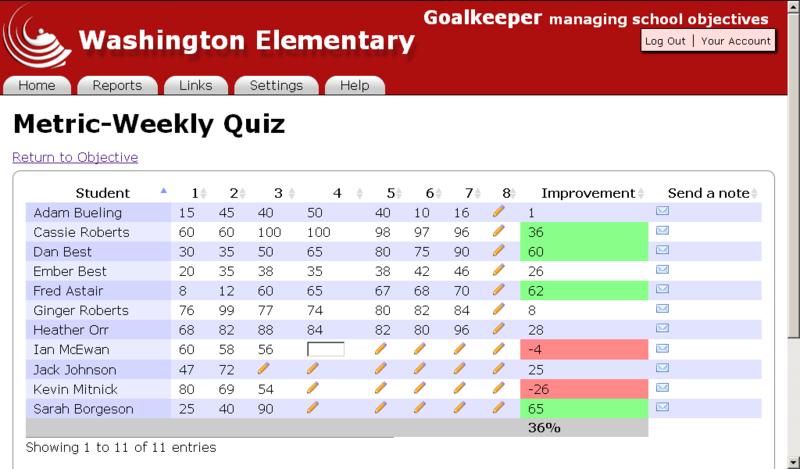 Another example is improvement on weekly quizzes. 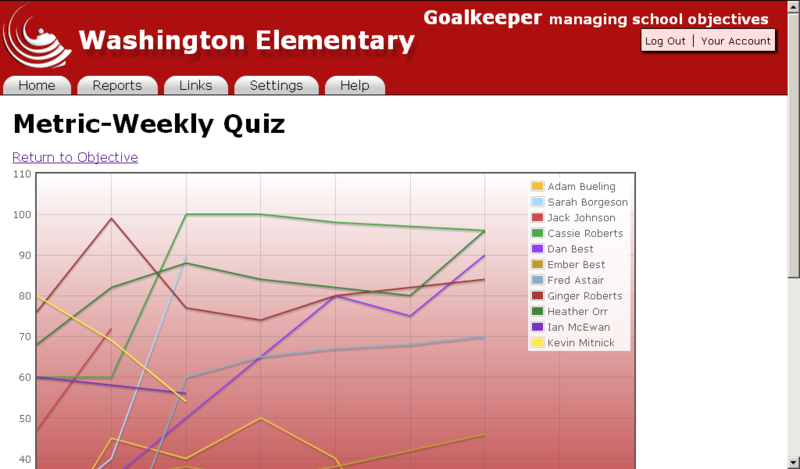 The weekly quiz would be the metric, and the teacher could enter a score for each week for each student. The system showed progress of each student and of the class towards those goals, and allowed teachers to send notes to parents and students. A reports page showed the progress using graphs. We ended up with a few things. A working demo of some of the capabilities that could easily be achieved with such a system, a data model that could be used to capture all the data necessary to evaluate students, teachers, schools, and districts, a role-based system that would allow students, parents, teachers, and principals to look at their data customized to their needs, and the beginnings of an understanding between the people with the need and the people with the capability to build a solution to solve that need. 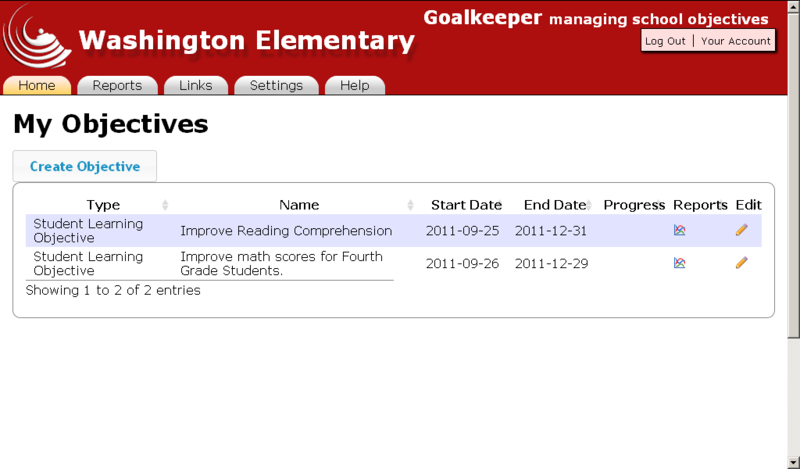 Goalkeeper is still a long way from being ready to put in front of teachers and students, but hopefully it will at least help in the discussion and the process of getting a system that solves their problem and does it well. ‹ What does WYZGYZ mean?